Sometimes you stumble across a portfolio where the artist only has a couple of comic based pieces, other times there can be just one work so brilliant, you'd risk being stoned to death by fellow art lovers for putting something else beside it. 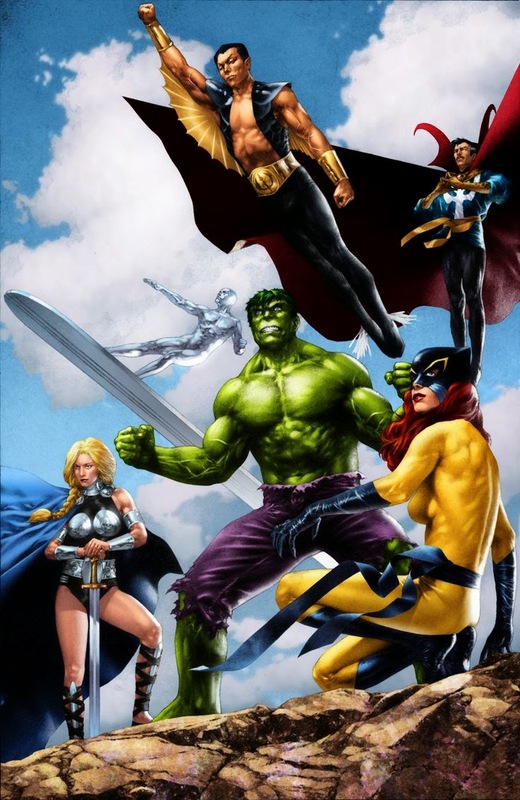 These are Random Works of Wow and illustrating the point this week is Jay Anacleto with a series starring the 80's line ups of Marvel's greatest teams, like The Defenders here. See, Hulk can still work at 'normal' sizes! As the eagle-eyed can tell, the four images all connect together. 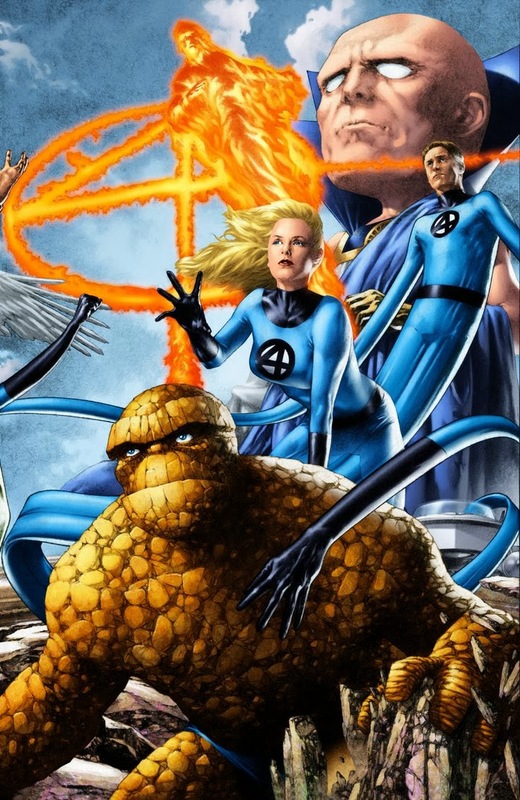 Defenders first, the Avengers A-Team and the B Crew, with The Fantastic Four capping off the end in style. I'm not sure if these stunning images served as posters or variants for the covers to Marvels: Eye of The Camera, Jay's work with writer Kurt Busiek on the 80's based follow up to Marvels, but the teams and their line-up's would suggest so. An issue of the high profile mini-series featured the era's X-Men and that might count for the mutants missing here, but it is nice just to have the golden heroes shine for a bit even though Herc and Widow tease a bit of The Champions, Alpha Flight would have made the best fifth. Jay's Sasquatch is something I need to see before I die! Look at how round yet solid Jay makes The Thing look, and how he takes Sue, whose development from not just 'Girl' into Malice and The Invisible Woman was a key part of the franchises 80's leads the attack rather than lurks as a wallflower as she was earlier illustrated to do. Oh yeah you probably want the full connected piece huh? Remember, click to enlarge folks! I didn't just shove the above up, because in this case I really feel seeing the individual segments gives you the sense of wonder that makes you marvel over the whole. Oddly enough, the entire piece also relates to one of the main changes hitting IADW when 2014 finally rolls into town. Looking forward to it! What do you think! Sound off below, click to enlarge or view more Random Works of Wow here. To get individual shots of The Avengers, you'll find the A team on the IADW Facebook page, while She-Hulk and Wonder Man spice up the IADW Google+ - grab em both! Wow and Damn! Nice to see he's still got it. I remember to first seeing his work @ Image on titles like Aria and Athenia Inc. How is he not at least doing covers on a regular basis for either of the big two? Craziness. Wow, when did this series come out, I just love these images, esp the FF one obviously. Just love 'em. Hey Karl! Well this is Marvels: Eye of The Camera is definitely something you'll want to track down, Thing has the cover of issue #1 all to himself! Due to the time taken to render such detailed images, issue #1 came out in December 2008, and issue #6 February 2010. Add to that the book had been announced for ages prior, as a sequel to Marvels which occurred in '93. Marvel wanted someone who looked like Marvels Alex Ross but wasn't, and they definitely found that appeal in Jay, but I just don't feel they promoted this book to the point a sequel of its magnitude should. It covered the darkening of 80's Marvel, including Ghost Rider, the arrival of The Punisher, Secret Wars, Wolverine, the death of Elektra, the honouring of X-Factor and the death of the X-Men in Dallas. I won't say what FF events get in, but when it comes to 80's there's no real surprise what tops the list. Find it - you'll love it! impressive, and not something i imagine he was able to get done in a few days. oh i sure would have liked to have seen this guy do The Suicide Squad or something Rom related even if it was just the dire wraiths i bet he'd make them look awesome. Tbanks Dave - he sure would! As for your suggestions, I know he's done Ivy, but I think that's all so far.